Olentangy Liberty’s Cole Corder chips onto the green during Friday’s opening-round action at the OHSAA Division I State Tournament at OSU. Olentangy Orange’s Emily Fisher fires a shot toward the green during the first day of the OHSAA Division I State Tournament at OSU. 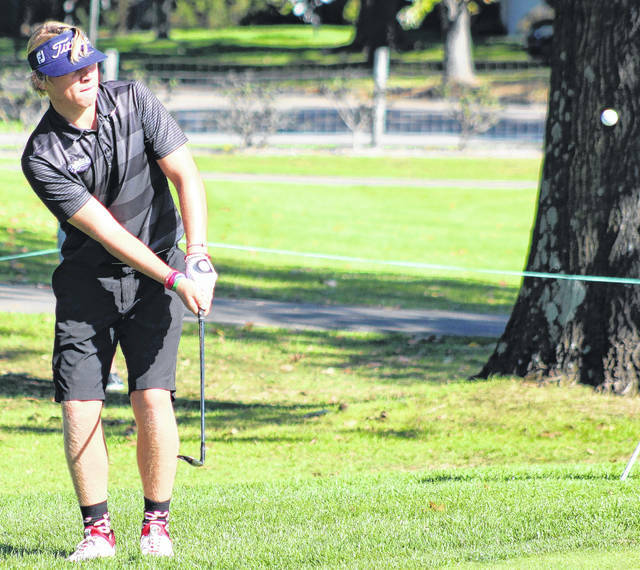 The Olentangy Liberty boys and Olentangy Orange girls golf teams are no strangers to the OHSAA Division I State Tournament … and it showed during Friday’s first-round action. The Patriots, who have been to the state showcase three out of the last four years, are in second with one round to go. They shot a combined 308 while navigating through the Ohio State University Scarlet Course. Dublin Jerome is in first place with a team total of 295 while Green is third behind Liberty with a 312. Cole Corder and Trey Rath led the Patriots, finishing tied for sixth with 74s. Grant Smeltzer (79), Josh Steyer (81) and Jacob Hickman (82) also chipped in. 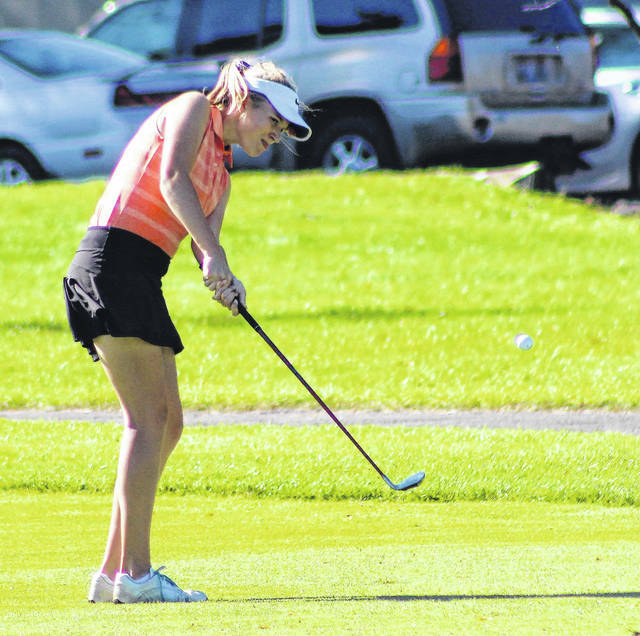 The Pioneers, looking to defend last year’s state championship — the first in program history — finished day one all alone in first place on the girls’ side. They fired a combined 305 on the Ohio State University Gray Course. Toledo St. Ursula Academy is second through 18 holes with a 309 while Centerville is third with a 310. Ashley Au led the way with a 73 — a mark good enough for fifth-best overall. Other Pioneer contributors included Natalia Sompolvorachai (76), Riley Dean (78), Alyssa Kim (78) and Emily Fisher (83). The state showcase wraps up today at OSU.